Do you see the animal in this photo? This entry was posted in Travel, Travel Photos and tagged 50 Year Project, Africa, Blog, Blogging, Botswana, Life, Nature, Photography, Travel, Travel Blog, Travel Journal, Travel Photo, Wildlife. Bookmark the permalink. Oh my gosh! I had to look twice to figure out what the heck that was! What a capture! Peek-A-Boo, I see you Pumba :). Hehe! Did it see you? I am not sure if warthogs are like other hogs, lacking in sight, but excellent in smell and pretty good in hearing. Awimbawae, Awimbawae, Awimbawae, Awimbawae, Awimbawae, etc, etc, fill in the rest as that could carry on for some time! Now I want to watch the film! Can you believe I still haven’t seen the movie? They always brought a smile to my face. Yep in his own way. Yep, but I am not sure I’d hang about long. Not sure I would want to mess with him. Nice shot! I had to look more than once. I did as well when I was there. Fun! Talk about natural camouflage! Yes. I realized that when we saw all these animals in their natural habitat. I had to read the comments to figure it out! I wouldn’t want to mess with those tusks. I can see a hog but I am a bit confused about the position…did the earth swallow him? He’s hiding in a hole. He’s beautiful. Wouldn’t want to meet him at night, though. Scary. love it-let me join the many others who think you are an amazing photographer. i love your pictures. 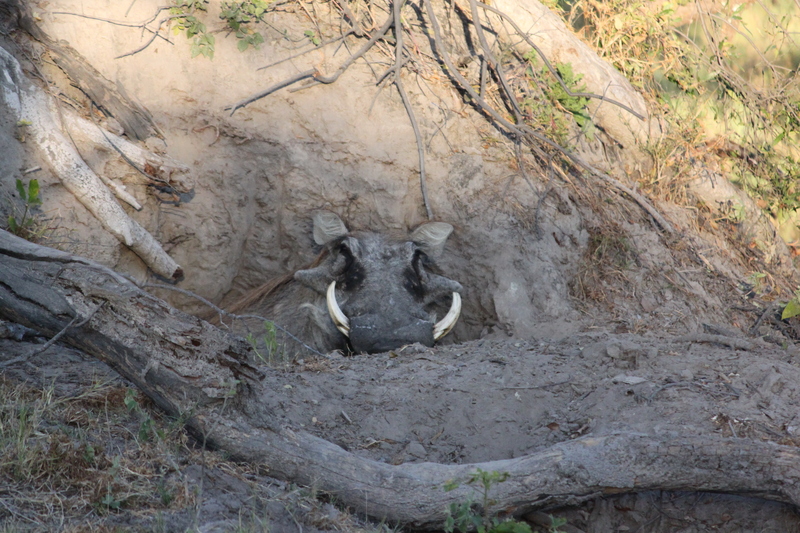 LOL – a warthog that’s camera shy!